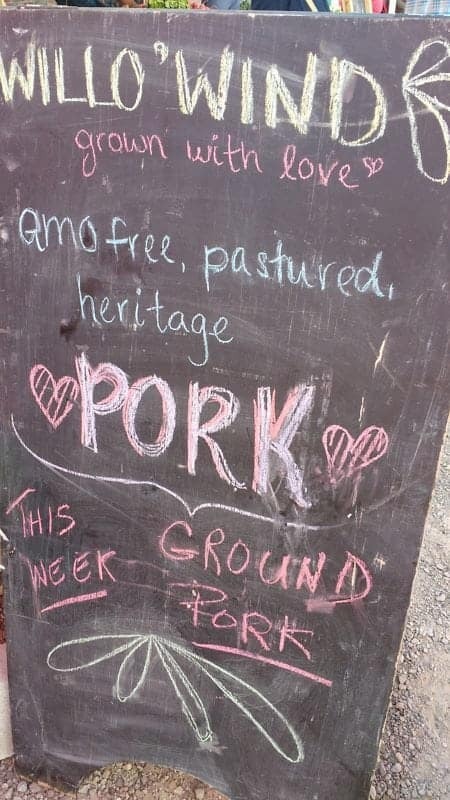 There is nothing better than a farmer’s market to get into the spirit of an area. Wouldn’t you rather stroll the aisles of a fresh farmer’s market in the sun than roll a cart down the packed aisles of a grocery store? Farmer’s Markets show us the best of a region and a country, they are the cultural heartbeat of a place. 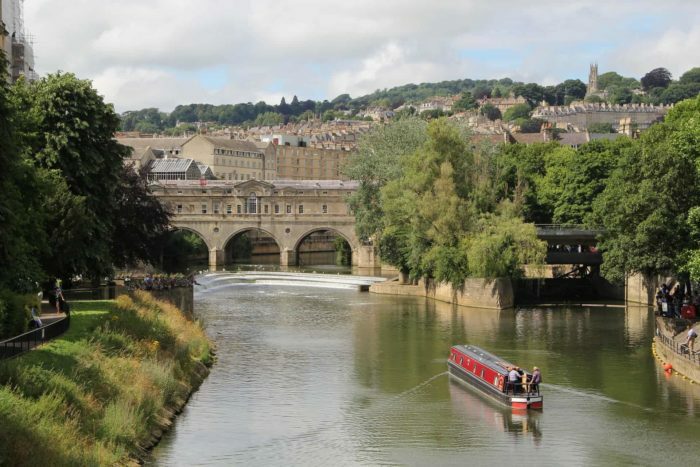 From showcasing local produce, meats and lots of handcrafted goods to knowing exactly where your purchases come from. 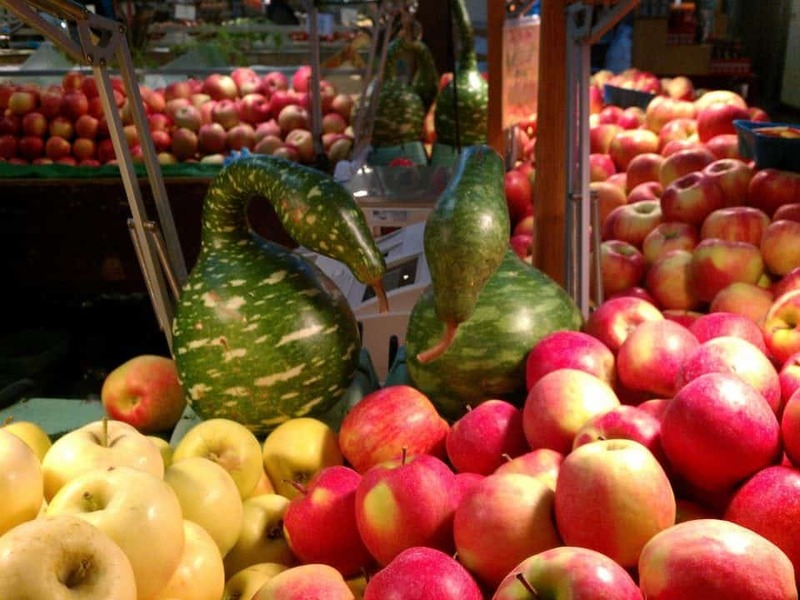 The local farmer’s market is the best place to experience local culture, learn about fruits and vegetables you may never have seen before and enjoy supporting the local community. I have so many reasons why I love a Farmer’s Market. I can taste a wide variety of products and samples, I can buy the freshest locally grown fruits and vegetables at their peak. I know my butcher and sausage maker and they know where that cow ate and if it was treated well. My eggs are free-range, even food I buy that is prepared is fresh, healthy and different from what I cook at home. There are many reasons to support Farmer’s markets in any county or city you are visiting or living in, here are just a few. From buskers to fancy popcorn I love the feel of a market. 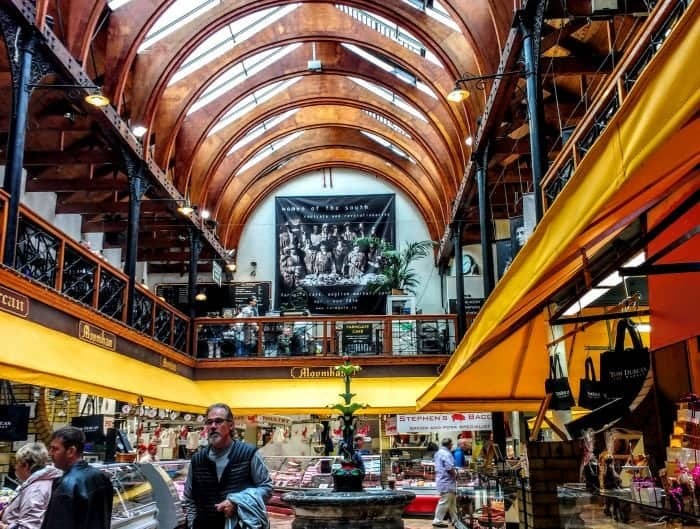 The warm feeling that we are all shopping as a community and supporting local producers is a great reason to shop at a Market. I can meet my friends both new and old, learn about different ways to serve the produce or meats on sale. Find really interesting prepared foods that I would never have had to chance to taste before. 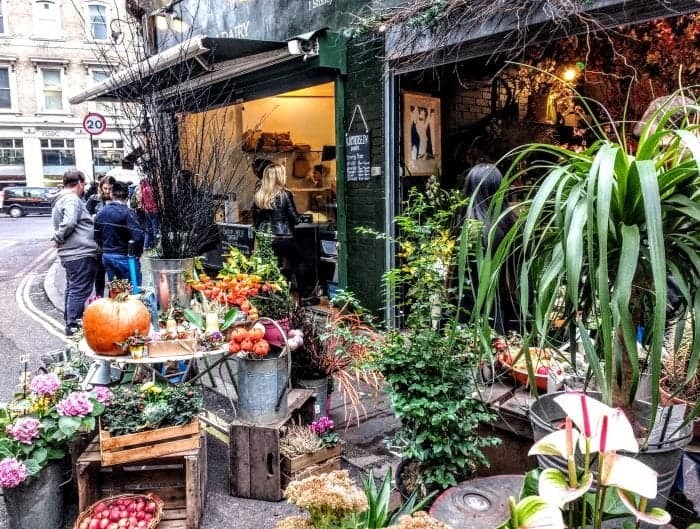 I can listen to the buskers, grab a bunch of beautiful fresh flowers and treat myself to a hand made cupcake or Maple Syrup from a local woods – who wouldn’t shop at a farmer’s market? I know that the fruit and veg I buy at the farmer’s market is locally grown and in season. I can get “organic” cheaper than at the grocery store and I learn about the methods the farmers use to produce their products. There is no trucking in of unripe fruits, gassing the vegetable to get a longer shelf life. There is not a tone of plastic packaging to that goes into the environment. The farmer’s market allows me to make good decisions about what the family will eat and enjoy. I know the food I buy is in season, yes there may be tomatoes in December but my local farmer’s market lady warns me that they will be mushy and to try to locally grown hydroponic tomatoes which are fare tastier. I know in the winter months I will be buying cabbages, brussels and all that hearty food that works in deep dark delicious casseroles and stews. In the summer months I look forward to the fresh tomatoes, baby lettuces and an abundance of fruits and vegs I can harvest from the market and turn into jams, jellies and chutneys to last the winter. Small producers and family farmers have a difficult time competing in the grocery store chain business and corporate food companies. They are often not competitive and can only supply limited amounts of product. This is where we the consumer benefits. We get the pick of the crop and we get to support our local economies, family farmers and local arts and crafts people. It’s the old adage shop local and support your community. Not only do you have to bring your own shopping bags (cutting down on plastics) most markets don’t plastic wrap the food. Food in Canada travels on average around 1800 miles to get to your local grocery store. This shipping takes a lot of carbon offsets to manage its environmental foot print. Corporate agriculture also uses a lot more resources than locally grown food, more pesticides more gas and oil to harvest with massive combines. 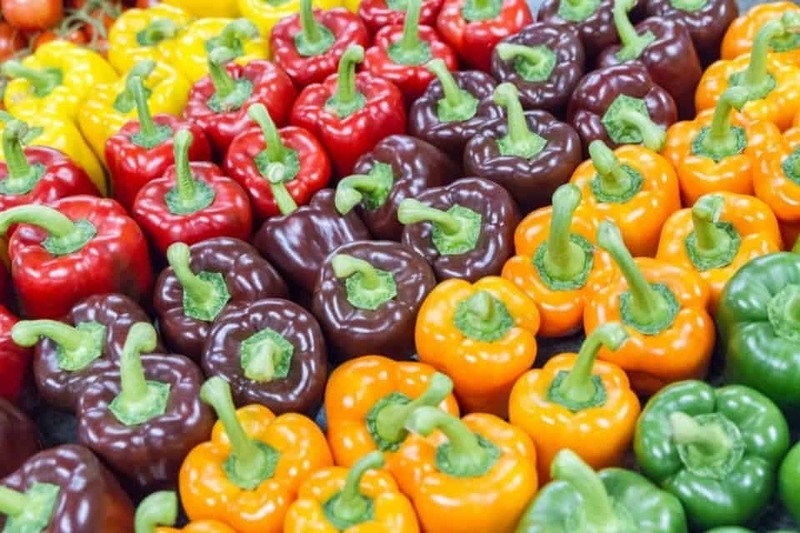 Farmer’s market produce is produced in smaller easier to manage farms and market gardens reducing the environmental impact of corporate farming. At the farmers market, you can find meats, cheeses, and eggs from animals that have been raised without hormones or antibiotics, who have grazed on green grass and eaten natural diets, and who have been spared the cramped and unnatural living conditions of feedlots and cages that are typical of animal agriculture. Our local Mennonite population in Ontario is well known for their meats both cured and uncured. These farmers know exactly what cow the meat came from, what field it grazed in and how it was treated humanely through its life. That stuff is important to me. Those are just a few simple reasons why I love Farmer’s Markets. In Ontario we are really lucky to have many fine markets but I also get to travel the world and experience farmer’s markets in many other areas. I love that part of traveling because I get to try things that I have never seen in a Canadian farmers market and experience the local culture. 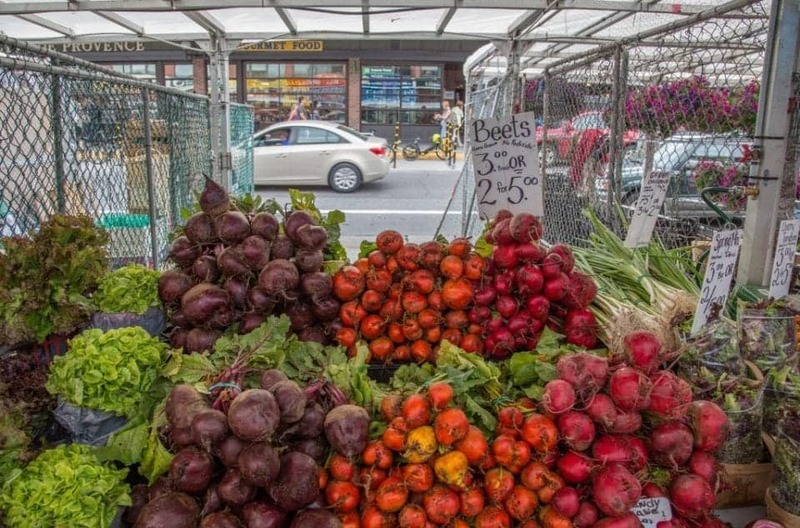 The Best Farmer’s Markets in Toronto include some of the finest you will find in the world. The Junction Market was founded in 2012 and it is a small but jam packed market in the heart of the Junction on Dundas Street West. Complete with artisanal foods from cheese to sausages the market is a local treat for those living in the area. Some of my favourites are the artisanal sausages and the wonderful Zimbabwean Pies at Mnandi, distinctly seasoned with spices imported from Zimbabwe these pies are full of meat and veggies and totally delicious. There is much to love in this market and I think I tasted it all. A few times a year the Market hosts an evening event consisting of a street party with tons of locally made and produced goodies. 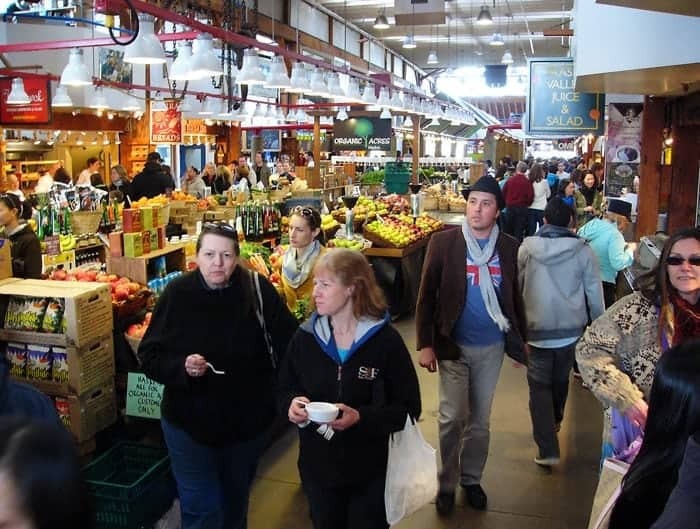 Here are the best farmers’ markets in Toronto from the TO Blog, one of the best sources of Toronto information on the internet. 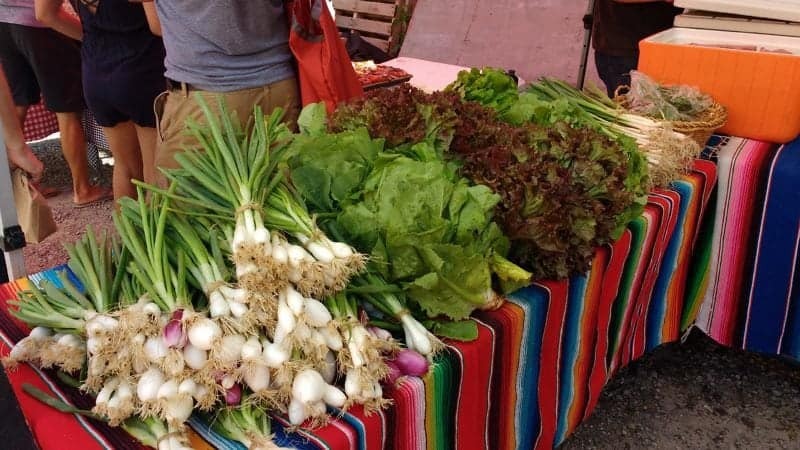 This Saturday morning market runs from 8 a.m. to 1 p.m. year-round and has become a magnet for locavores looking to buy prime produce, farm fresh eggs, meats, cheeses, and wild flowers. Aside from shopping, visitors can expect live music, kid-friendly activities, tastings and more. The east side farmers’ market draws huge crowds to Jonathan Ashbridge Park on Sundays from 9 a.m. to 2 p.m. Here you’ll find seasonal delights like ramps, fiddleheads and rhubarb from local farms, plus artisan sourdoughs from De La Terre, and refreshments from Earth & City and Augie’s Ice Pops. After 11am there’s even beer! Stock up on kale and fresh baked goods in a single trip to The Stop’s first rate farmers’ market held each Saturday from 8 a.m. to noon. 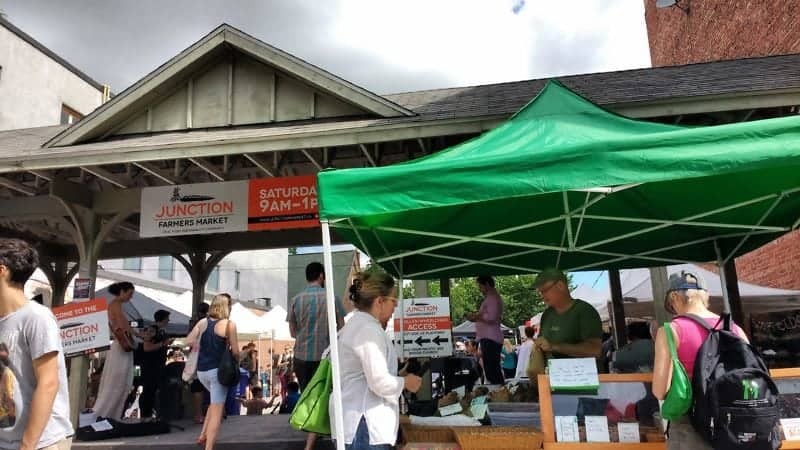 This is another market that is open all year round, and features dozens of merchants including favourites like the Alchemy Pickle Company, Dundas Park Kitchen, and Bizjak Farms. 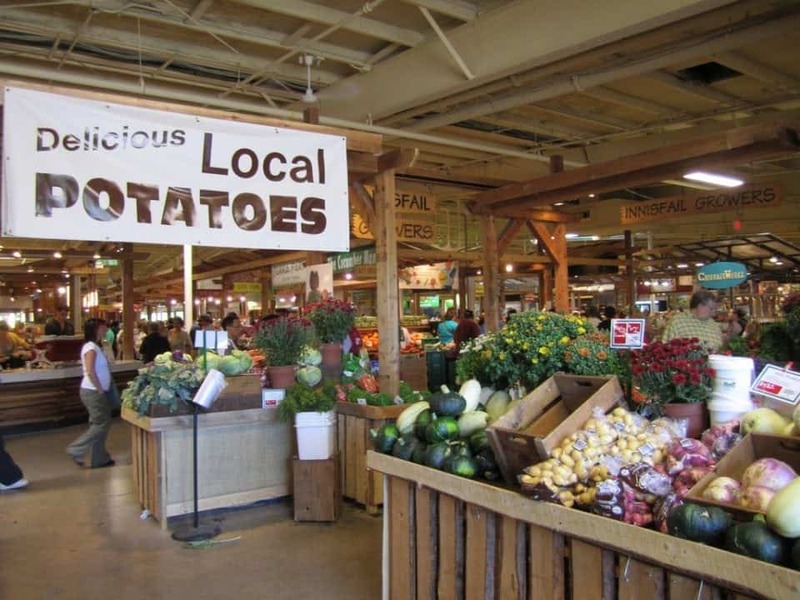 Easily accessed by transit and operating every Thursday year-round from 3 p.m. to 7 p.m., this farmers’ market is a favourite for stocking up on fresh fare on the way home from work. 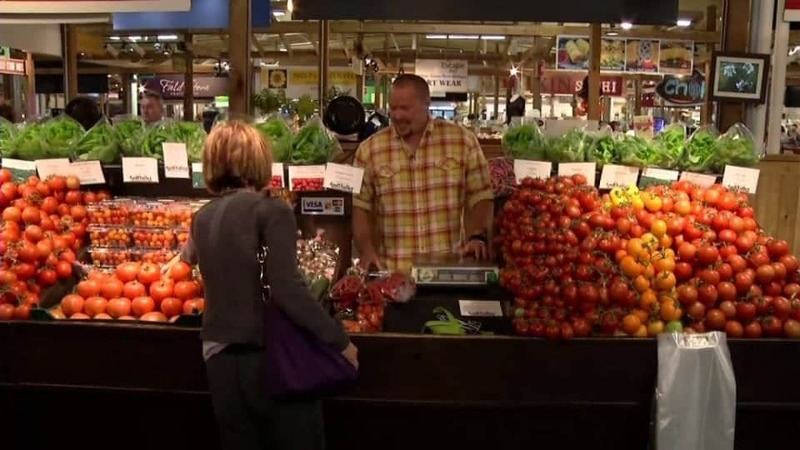 Shop for fresh produce, local organic beef, olive oil, maple syrup, preserves, and more. Refuel along the way with sheep’s milk ice cream cones. 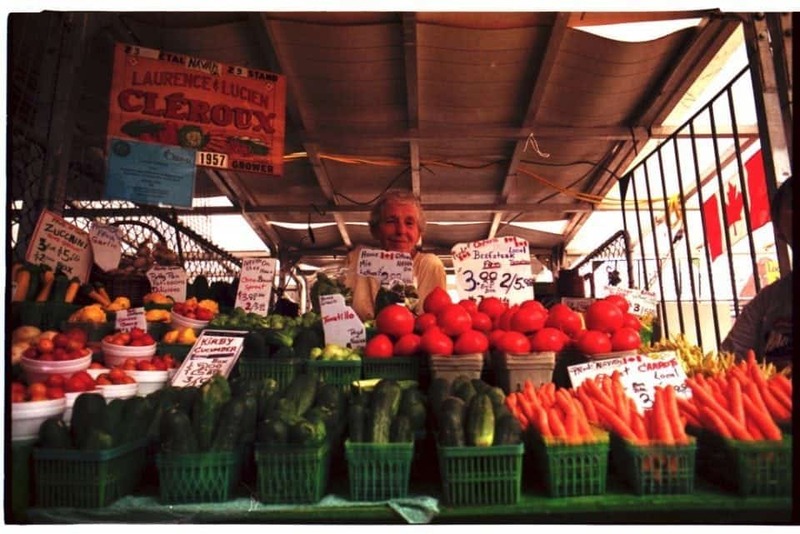 Located on Upper Gerrard between Woodbine and Coxwell, find this farmers’ market in business every Wednesday from June to October – rain or shine – from 3 p.m. to 7 p.m. In addition to farm fresh produce, enjoy onigiri from Abokichi and Zimbabwaen meat pies from Mnandi Pies. 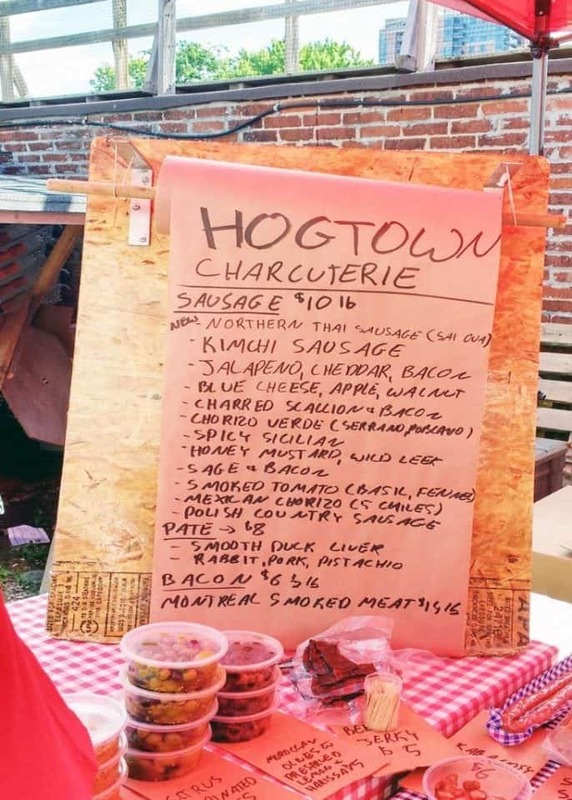 The West-End Food Co-Op hosts this market in Sorauren Park every Monday from 3 p.m. to 7 p.m. Market-goers will find fixtures of the farmers’ market circuit like ChocoSol, and Forbes Wild Foods, as well as local gems like Sonam’s Momos. At the northwest corner of Trinity Bellwoods Park, this popular outdoor market is a weekly affair that pops up every Tuesday from 3 p.m. to 7 p.m. Shop for an array of fresh produce direct from farmers along with notable stalls like Ali’s Fish Shack, Monforte Dairy, and St. John’s Bakery. This open-air market, held every Thursday from 3 p.m. to 7 p.m., is a favourite summer attraction for the Danforth and Woodbine community. Above and beyond basic farm-fresh fruits and veggies, find stellar ready-to-eat options, kid-friendly activities, live entertainment and the occasional movie night. Fresh Wednesdays brightens up all that concrete in front of City Hall from 8:30 a.m.to 2 p.m. each week from June until mid October. In addition to shopping stalls trading fresh produce, breads, and cheeses, the lunch time clientele enjoy food vendors and live music. Farm fresh produce, baked goods and preserves can be found Thursdays from 8 a.m. to 2 p.m. in this courtyard off King West. The farmers’ market pops up from late May to late October and features 18 vendors each week selling fresh picked fruits and vegetables, honey, cheese, breads, flowers, herbs. Now in its ninth year, this season kicks off in May and will run every Saturday from 9am to 1pm in Withrow Park. Aside from the expected assortment of regionally grown produce and baked goods, highlights here include ice cream sandwiches from Sweet Sammies and preserves from Manning Canning. Every Wednesday from 3 p.m. until 7 p.m., this farmers’ market offers an array of fresh veggies, halal meats, artisanal breads, and cheeses offered by local businesses including Fazla’s Cake House, Ethiopian Samosas, and Lemon Lily Tea. Every Wednesday from 2pm to 6pm, a collection of local growers and food purveyors gather at Dundas West at Islington to showcase organic produce, fresh baked breads, cheeses, preserves and more. Finish your shopping then tour the museum free during market hours. Soak up the sun at this outdoor marketplace on Tuesday mornings from 8am to 2pm in front of the East York Civic Centre on Coxwell. 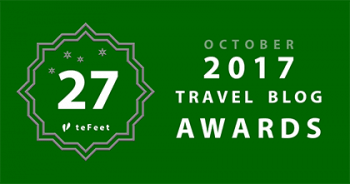 Expect to find freshly harvested Ontario fruits and vegetables as well as honey, preserves, cured meats, cheeses, baked goods, and fruit smoothies. I have lived in Toronto for two years now and I have never been to any of these Farmers markets. I am a fan of healthy diet and I definitely need to check out some of these sooner. Oh Julie you don’t know what you are missing – my favourites are the small ones like the Junction Market some really unique tempting goodies to be found not to mention its all local and within growing distance of Toronto so you are supporting small business.